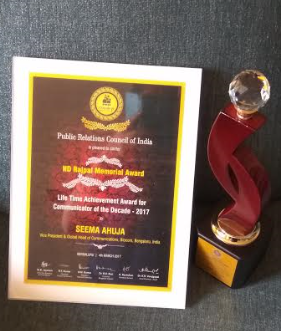 Seema Ahuja, Vice President & Global Head of Communications of Biocon Group, was recently honoured with ‘ND Rajpal Memorial Award’ for ‘The Communicator of the Decade – 2017’ by Public Relations Council of India (PRCI). 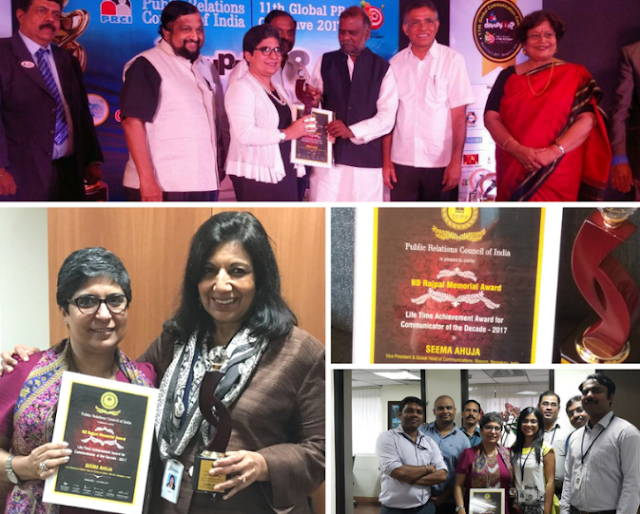 She received the Award comprising a Trophy and a Certificate from Mr Anjaneya, Minister of Social Welfare, and Government of Karnataka at the ‘Chanakya Awards held during PRCIs 11th Global PR Conclave’ at Bengaluru in March 2017. Kiran Mazumdar Shaw, CMD Biocon, my current mentor since 2011, D S Brar, former CEO & MD, Ranbaxy, Late BK Raizada, my mentor at Ranbaxy, Malvinder Mohan Singh, former CEO & MD, Hari & Shyam Bhartia, CMD Jubilant LifeSciences, Dr DB Gupta, Chairman, Lupin, Kamal K Sharma Vice Chairman Lupin, the great stalwarts of the pharma industry, are some of the inspirational Business leaders I had the good fortune to work with. I owe a BIG thank you to all of them as they shaped me into the professional that I am today,” She added. Seema Ahuja is a multifaceted Corporate Communications & Brand Management Expert who has been in Senior Leadership roles since 2004. During her 25 years career, she has been associated with Hospitality, Pharma, Life Sciences and Biotech sectors and has played a critical role in reputation management and building corporate brand value across global markets. She has specialized in Marketing & Advertising, Communications & Brand Management, Media Relations & PR, Crisis Management, Internal Communication and Employee engagement and Digital and Social Media. Currently she is steering the Global Corporate Communications function for Biocon, which is India’s largest publicly listed biotech company. As an emerging global biopharmaceuticals enterprise, it is driven by innovation and committed to make quality healthcare accessible to patients and partners across the globe.